Always telling it like it T.I.S TS Madison recently responded to rapper Waka Flaka Flames anti trans statements. 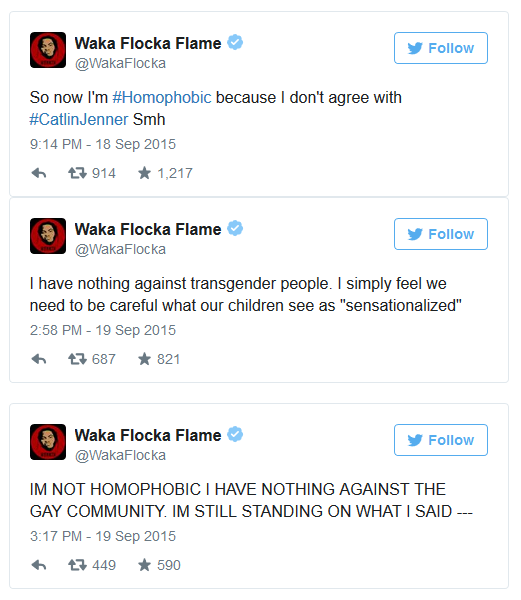 Waka Flaka recently appeared on the Breakfast Club radio show where he spoke out against Caitlyn Jenner and trans individuals, calling them evil. Speaking to Charlamagne Tha God on The Breakfast Club, Flocka suggested that undergoing a gender transition was the work of the devil, not God. "You know what the world is today? Women are afraid to be a wife and young males are afraid to be men," the reality star said, via The Hollywood Reporter. He also called the media "evil" for marketing "young girls, transgenders" and not "families and husbands and wives." "I ain't got nothing against Bruce Jenner," he added, using Caitlyn Jenner's former name. "But you are who God made you, not who you became. That's how I feel...God ain't put those feelings in you, man. That's giving into the devil playing tricks on their minds." I Just watched Waka Flocka give an interview the other day and I want to say I like Debra but I want to be honest he said “Evil” and I thought it is that crap that keeps us down and he has millions of fans and he is saying that and I love you’re mother but you don’t know me to say that that I am evil and delusional. You are not delusional at 7 yrs old. There is someone out there that is the same as you. The truth is trans people just do not want the shadows anymore. We have been around for centuries. So when he said that I was like we are blendable it could have been a nurse that was taking care of you after you suffered gun shot wounds from gang banging so how dare you say that. I don’t judge you so don’t judge me. He needs to be more mindful because one day he will have to revisit those words. 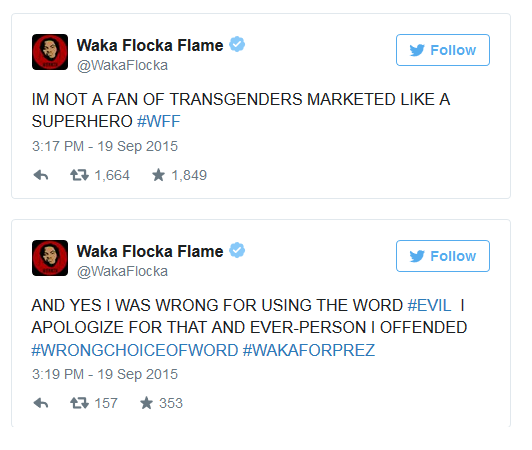 Waka later apologized via twitter.